Bowling Green's Mitch McLain (6) makes his move against Bemidji State's Nate Arentz during Saturday's game (Photo by Todd Pavlack/BGSUHockey.com). 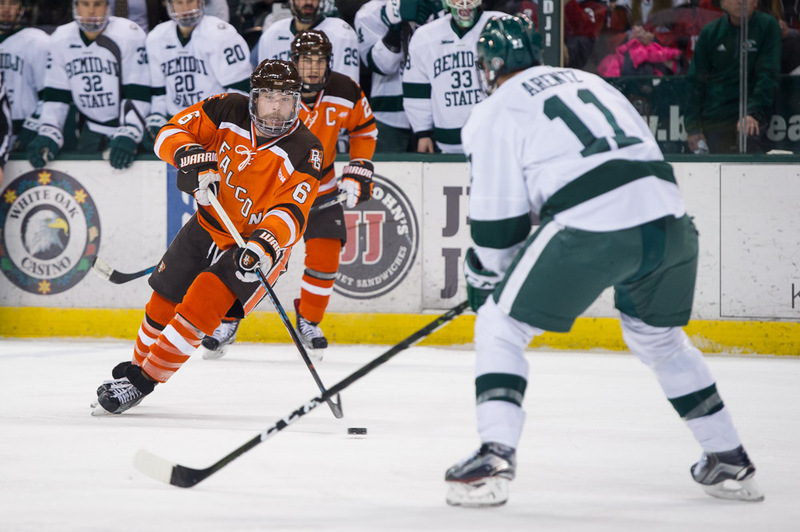 BEMIDJI, Minn. — Bowling Green played well during the final 50 minutes Saturday night. The Falcons also skated with poise and confidence. They spotted Bemidji State the game’s first goal before rallying for a 2-1 victory to finish a sweep of their best-of-3 series in the semifinals of the Western Collegiate Hockey Association playoffs. BG controlled and, at times, even dominated the final 2½ periods with its staple — a physical, puck-possession game in the offensive zone. The Falcons usually kept their defensive zone clean after turning too many pucks over early in the game. And when the Falcons broke down, Chris Nell was sharp in goal with 25 saves. BG was going for a sweep of the WCHA’s regular-season champion after Friday’s 4-3 overtime victory. The Falcons were out-shot Friday by a 48-34 margin, but Nell’s work kept his team in the game. The Beavers — desperate to force a third and deciding game Sunday night — came out hard during the first 10 minutes. Gerry Fitzgerald’s breakaway goal gave Bemidji a 1-0 lead, just 3:16 into the game after the Falcons turned the puck over at their defensive blue line. Bemidji had a chance to increase its lead to 2-0 just over five minutes later, but Nell used his left pad to stop a short-handed breakaway. The Falcons eventually started to play well after that. BG finally tied the game on Kevin Dufour’s goal only 95 seconds into the second period and took the lead on Matt Pohlkamp’s goal with 16:11 to play in the game. The Falcons also had a chance to crack in the third period. They failed to score during a five-minute power play with 15:46 left in the game and then took a penalty just 54 seconds after the major ended. But BG killed off the penalty to protect its one-goal lead. That Beaver power play ended just 50 seconds into the advantage because Bemidji was called for hooking. Bemidji then pulled goalie Michael Bitzer for the extra attacker with just over one minute left in the game. Nell made two point-blank saves in the final minute, and covered the puck with 5.1 seconds remaining. BG’s Mitch McLain won two defensive-zone faceoffs in the final minute, while Matt Pohlkamp blocked two shots. The Falcons swept Bemidji after losing three of their four regular-season meetings with the Beavers. Bemidji posted a 2-1, 4-1 sweep to start the season. 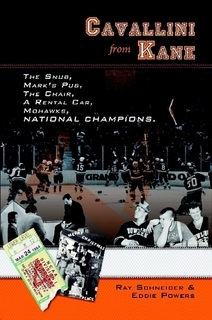 The teams then split a Jan. 5-6 series in Slater Family Ice Arena. BG posted a 4-2 win in the series finale after Bemidji earned a 2-1 win in the first game. OFFENSE: The Falcons held a 32-26 edge in shots, and generated sustained pressure by playing in Bemidji’s defensive zone. That was in contrast to Friday when they defended for a large part of the game. Bemidji is second nationally in goals allowed, 1.93 per game. The Falcons had a 16-8 edge in shots during the final period. Each team had nine shots in the second period, although BG held the edge in play. “The second period on, they dictated play,” Serratore said. ‘”It was fun to watch,” Nell said. Serratore also praised the Falcons for the way they defended and for the way they stopped his team’s transition game. The Beavers’ best offensive pressure came in the final minute of the game after they pulled Bitzer for a 6-on-5 advantage. STATS: Sean Walker led the Falcons with seven shots on goal, while Tyler Spezia and Pohlkamp both had five, and Mitch McLain, Dufour and Joe McKeown each had three. The defense pair of Mark Friedman and Adam Smith both had an on-ice rating of +2. The pairings of Friedman and Smith, and Walker and Alec Rauhauser seemingly never left the ice in the series. “The minutes those guys are eating is crazy,” Bergeron said. WINNER: Pohlkamp scored off a 2-on-2 rush. His shot from the bottom of the right circle handcuffed Bitzer. EQUALIZER: The Falcons tied the game on Dufour’s fourth goal of the series early in the second period. Friedman threaded a perfect pass from the right point through to Dufour, who was alone in front. Dufour faked Bitzer and scored from the left side of the crease. GOALTENDING: Nell was outstanding Saturday after allowing two soft goals Friday. The junior allowed just one goal during the final 95:38 of the series. He stopped 70 of 74 shots in the series and helped BG kill off eight of Bemidji’s nine power plays. Nell has a 2.15 goals-against average and a .916 save percentage in 33 games this season. He’s allowed two or fewer goals in 11 of his 15 games during the second half, posting a 1.69 goals-against average and a .943 save percentage in that span. Bitzer stopped just 60 of 66 shots in the series, but still leads the nation with a 1.71 goals-against and six shutouts. He’s fourth with a .932 save percentage. SPECIAL TEAMS: The Falcons were 0 of 4 on the power play Saturday, while Bemidji was 0 of 3. The Beavers had a 63-second 4-on-3 power play in the second period with the game tied 1-1, but couldn’t score. Bemidji also failed to score on three 4-on-3s during Game 1. In the series, the BG power play was 0 of 6 and Bemidji was 1 of 9. Bemidji’s penalty-killing is second nationally at 88 percent, and its power play is second in the league at 18.9 percent. PK: The BG penalty-killing is 105-of-117 (89.7 percent) in its last 26 games, including a 59-of-64 effort (92.2 percent) during the last 13 games. STREAKING: The Falcons’ seven-game winning streak is their longest since the 1987-88 season when they also won seven in a row. HEARTBREAKER: The series loss brought Bemidji’s season to a disappointing end. After being picked for sixth place in the coaches and media polls, the Beavers finished 22-16-3 overall and 20-6-2 in the WCHA. They won the league by 10 points over Michigan Tech. Losing in overtime Friday hurt Bemidji and might have been one of the key points in the series. The Beavers played well and easily could have won the game. They out-shot BG by a 48-34 margin and held two one-goal leads before BG sent the game into overtime in the third period. “That was a big loss last night,” Serratore said. NO TV: The championship game of the WCHA playoffs will not be televised, although the game will be streamed for a fee on WCHA.tv.